But don’t bank on it coming to America. Audi’s already-extensive SUV line-up is set to expand with a new baby crossover positioned below the tiny Q2. According to , Audi is expected to announce a as the latest member of the ever-expanding MQB family, slated to arrive before the end of 2020 after the automaker begins its onslaught of coupe-style SUVs starting with the Q8 later this year and the Q4 in 2019. When asked about a potential Q1, Audi sales and marketing boss Bram Schot hinted that it could happen in response to market trends. “You cannot ignore the SUV trend; the question is how wide and how deep do we make the program with SUVs?” he said. “Depending on the business opportunities, we decide on the future product portfolio. 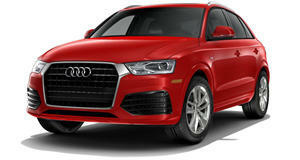 Don’t be surprised if in two or three years you do see the car, as we try to react fast to markets.” While an entry-level Audi Q1 would rival the likes of the BMW X1 and Mercedes-Benz GLA, don’t bank on it coming to America. Audi’s upcoming subcompact SUV is likely to be based on the new A1 supermini, which has proven popular in Europe but isn’t currently sold in the US, despite the A3 sedan selling well over here. Slated to arrive later this year, the next-generation A1 will be based on the smallest version of the VW’s MQB platform, which underpins the Polo. In Europe, this means the Q1 will most likely arrive with a variety of gasoline and diesel options including a three-cylinder 1.0-liter turbo, a more powerful 1.5-liter unit, and a 1.6-liter diesel. There could be a hybrid option too, by the time the Q1 rolls out before the end of 2020. Don’t expect Audi’s SUV onslaught to slow down any time soon, either. As well as the Q1, Q4, and Q8, Audi will also be introducing the fully-electric e-tron later this year along with the next-generation Q3, followed by the sleek e-tron Sportback EV in 2019.